School Approved Frankenstein is going to be the hit of the class party, Halloween party, or any spooky party! Super easy to make! Over the years more schools have implemented very strict rules for what parents are allowed to send to school, for class treats. 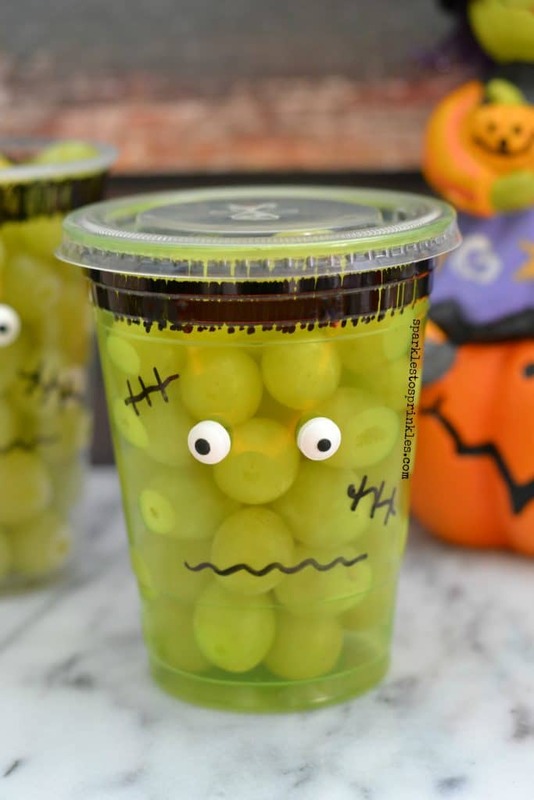 This is a super easy, super adorable snack for your child’s Halloween class party that is definitely on the approved list of treats (always double check with your school’s list). Head on over to Costco or BJ’s and stock up on some green grapes. You will need clear plastic cups, either 18 or 24-ounce cups will work great. Permanent markers, candy eyes or googly eyes and plastic lids. You can use either 18-ounce or 24-ounce sized cups, and you should be able to find lids in your local 711, Quick Check or Wawa, that will fit. My 711 has always allowed me to take lids when I explain I am using them to make a project for my kids. I also did this with 16-ounce cups but could not find lids to fit. If it needs to be portable for a class party you will want to stick with a sized cup that will fit a lid. This is adorable and so easy! I love it!! What kind of glue do you use to stick the eyes on? This is a great idea! Hi! These are so cute! Where did you but the cups? Or should I ask, what brand are they? Thanks! !